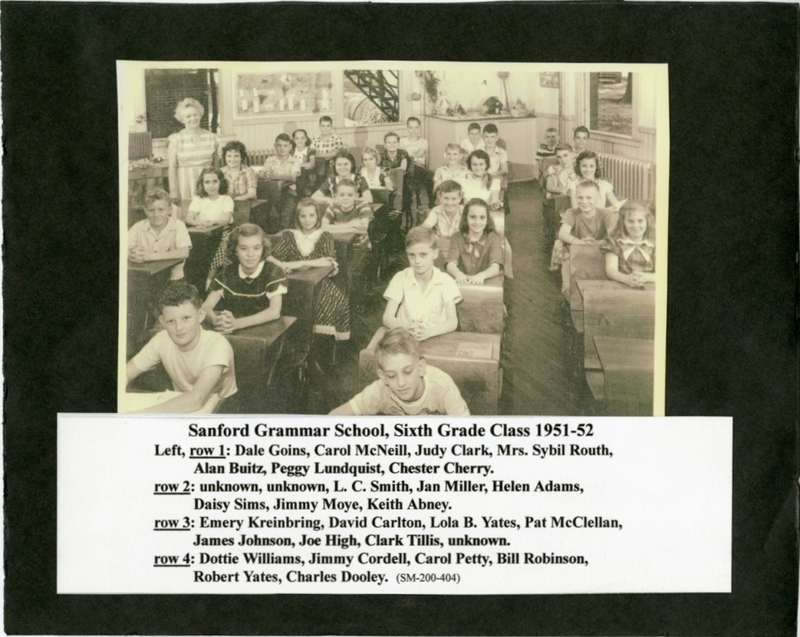 Sybil Routh's sixth grade class at Sanford Grammar School during the 1951-1952 school year. Some of the students photographed are Dale Goins, Carol McNeill, Judy Clark, Alan Buitz, Peggy Lundquist, Chester Cherry, L.C. Smith, Jan Miller, Helen Adams, Daisy Sims, Jimmy Moye, Keith Abney, Emery Kreinbring, David Carlton, Lola B. Yates, Pat McClellan, James Johnson, Joe High, Clark Tillis, Dottie Williams, Jimmy Cordell, Carol Petty, Bill Robinson, Robert Yates, and Charles Dooley. Left, row 1: Dale Goins, Carol McNeill, Judy Clark, Alan Buitz, Peggy Lundquist, Chester Cherry. row 2: unknown, unknown, L.C. Smith, Jan Miller, Helen Adams, Daisy Sims, Jimmy Moye, Keith Abney. row 3: Emery Kreinbring, David Carlton, Lola B. Yates, Pat McClellan, James Johnson, Joe High, Clark Tillis, unknown. 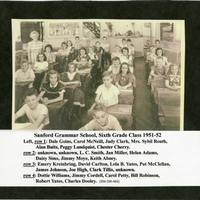 “Sybil Routh's Sixth Grade Class at Sanford Grammar School, 1951-1952.” RICHES of Central Florida accessed April 19, 2019, https://richesmi.cah.ucf.edu/omeka/items/show/4690.